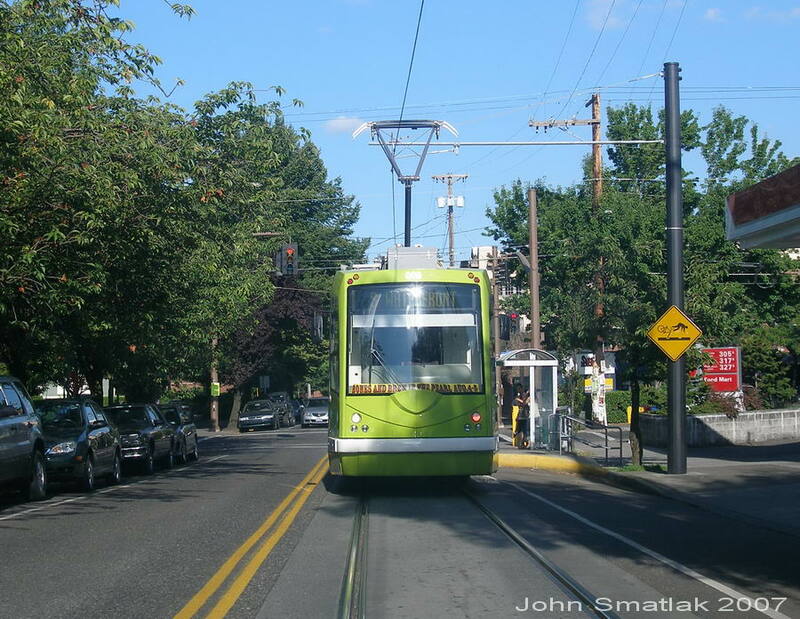 Opening in July 2001, the Portland Streetcar heralded the arrival of the Modern Streetcar to the United States. 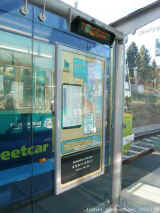 The system has been extended four times since its opening, and now provides daily service along a 3.6 mile route (soon to be extended). 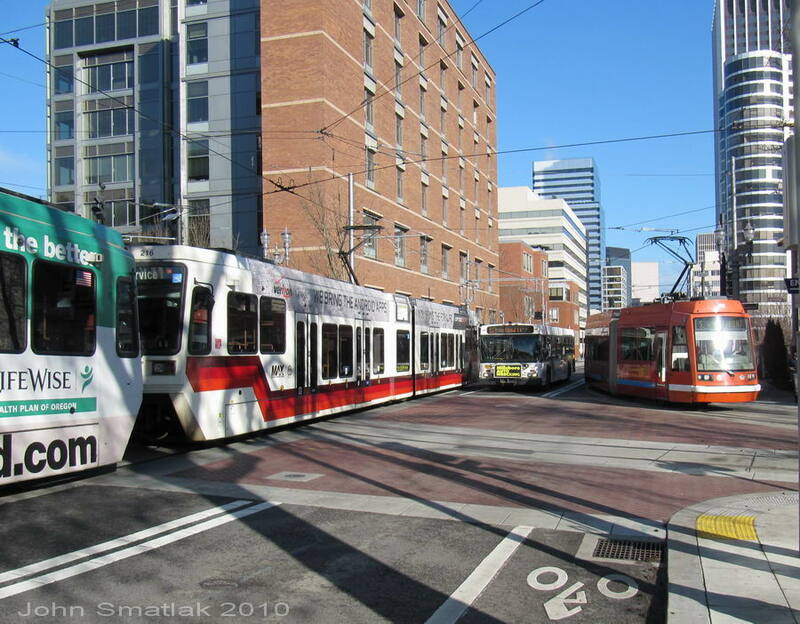 The majority of the line runs along pairs of one-way streets, separated by one or two blocks. Total one-way mileage for the complete loop is currently 7.2. 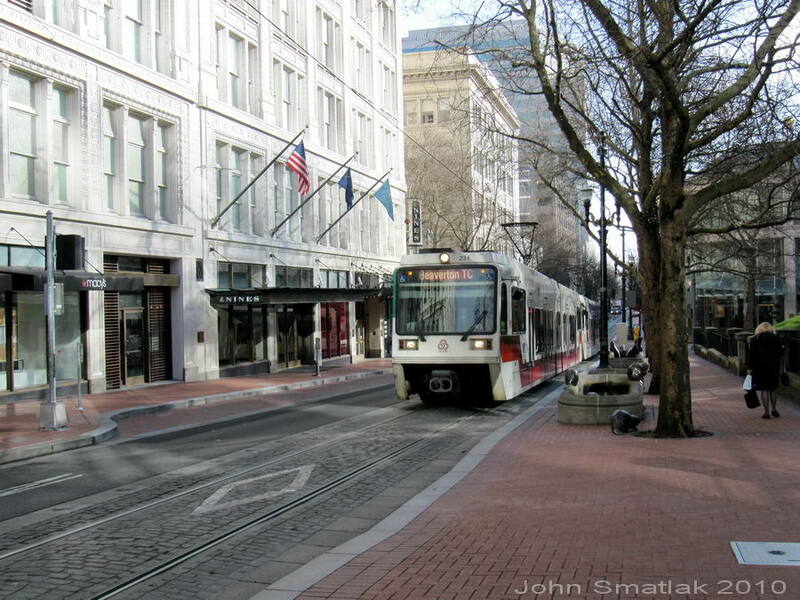 Much of the line operates within TriMet’s “fareless square” zone in the downtown area, so most trips are actually free to riders. 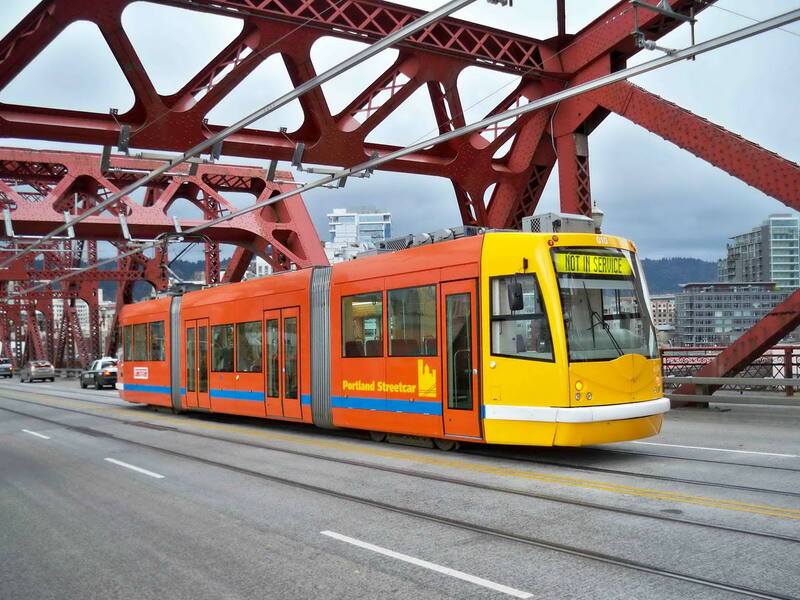 Portland made use of an off-the-shelf European streetcar vehicle design, providing a modern, air-conditioned vehicle with level boarding. 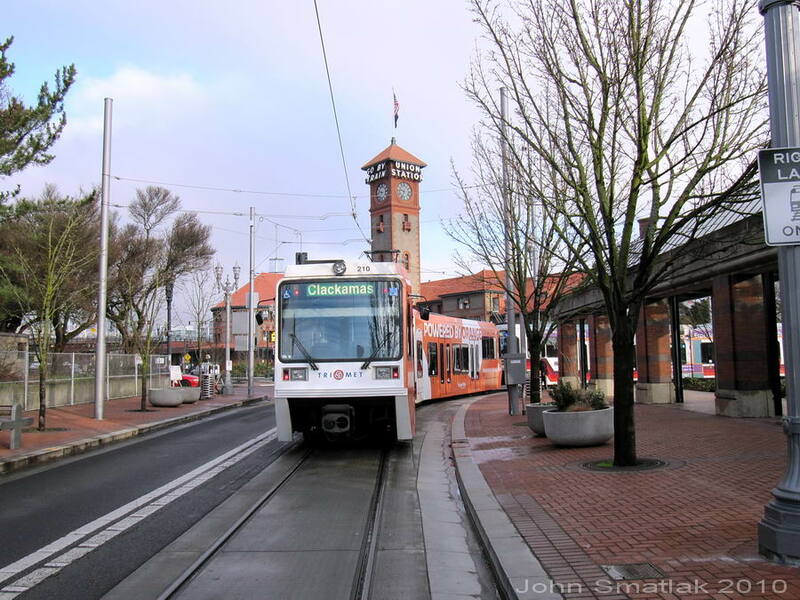 The system is operated by the non-profit “Portland Streetcar Inc.”, with service delivery contracted to local transit provider Tri-Met, who also operates the region’s extensive light rail system. 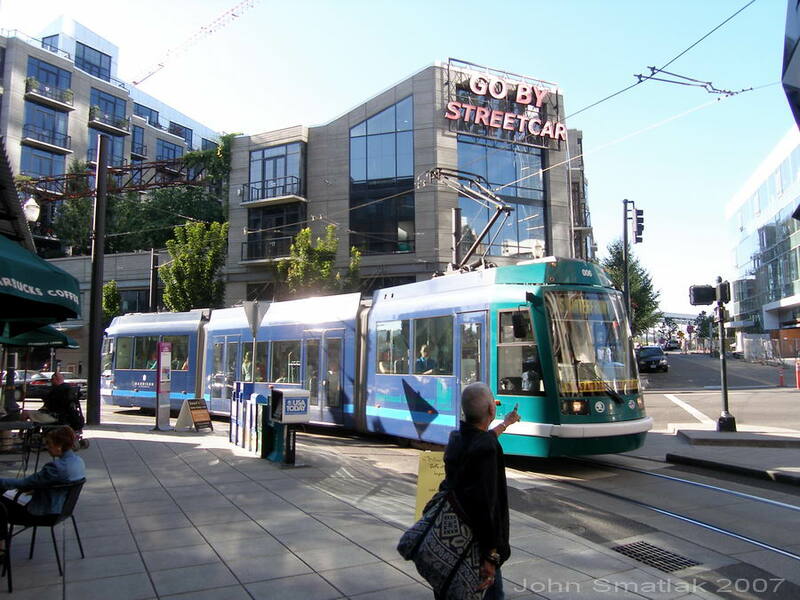 The streetcar is seen as “a unique public/private strategy to link investment in high quality transit service with major development”. 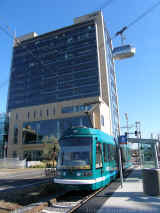 A January 2006 report by PSI entitled “Development Orientated Transit” notes that since 1997, more than 2.28 Billion dollars has been invested within two blocks of the streetcar alignment. 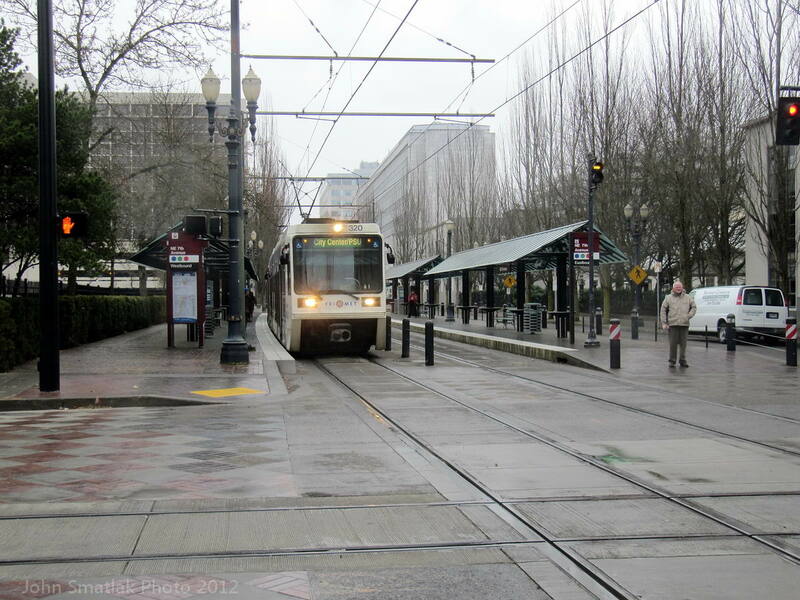 As of late 2008, the system was carrying 4.3 million riders annually. 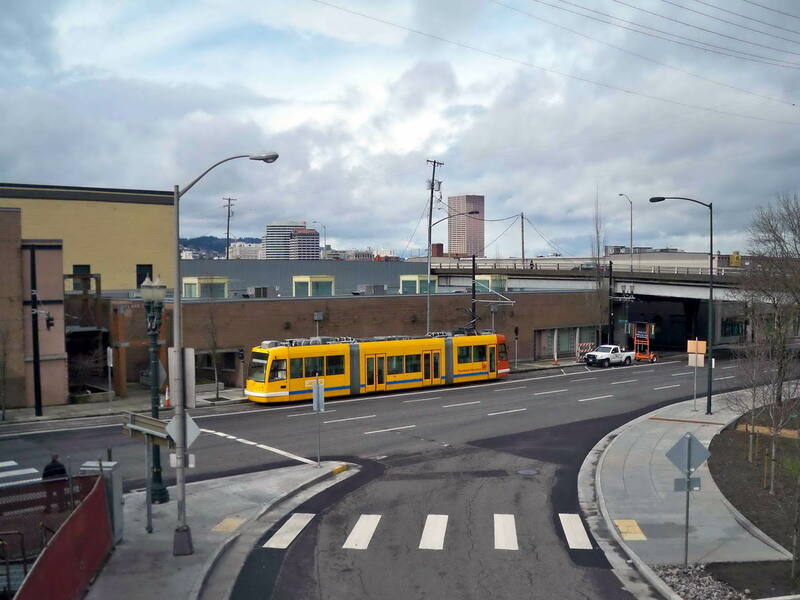 The next system extension will extend service from the Pearl District in NW Portland, across the existing Broadway Bridge, serving the eastern half of the Portland Central City. 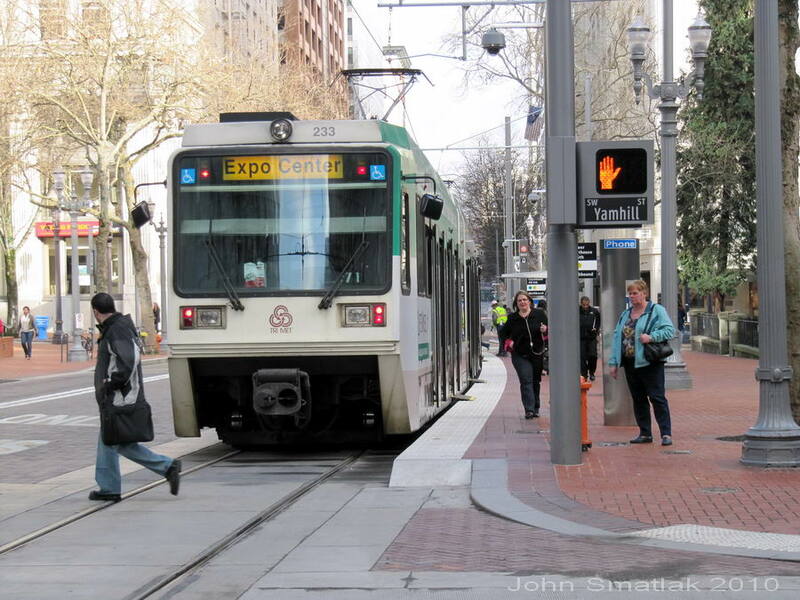 In May of 2009, it was announced that $75M in federal funding had been obtained towards the $127M project, and construction of the new 3.3 mile loop began in January 2010. 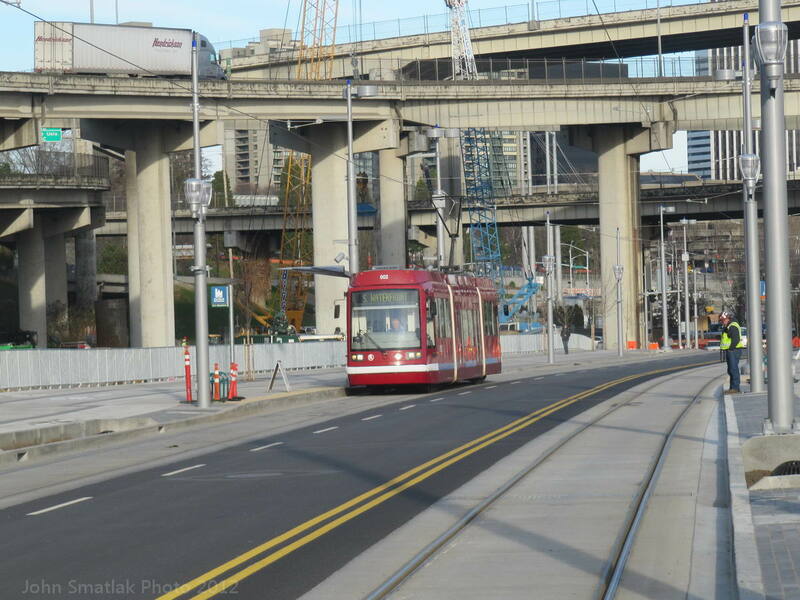 Construction was substantially completed in January 2012 and testing is now underway, with service expected to start in Fall 2012. Click on the map at left for more information on the system. 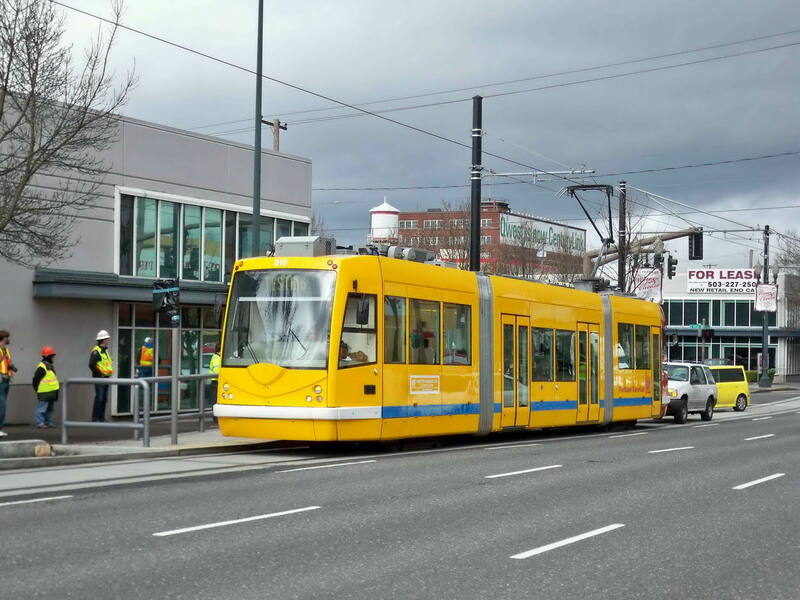 A more detailed history of the project’s development is also available on the history page of the Portland Streetcar website. 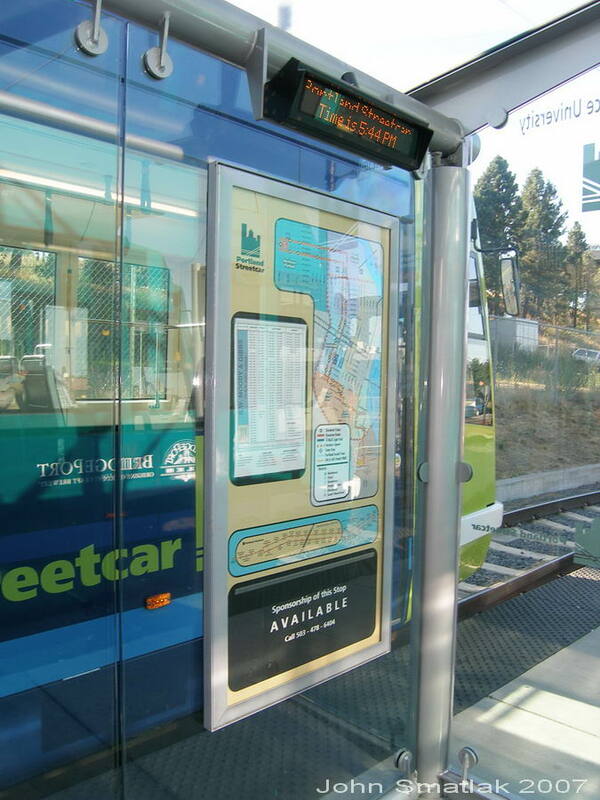 feature easy-to-read maps and real time arrival info. 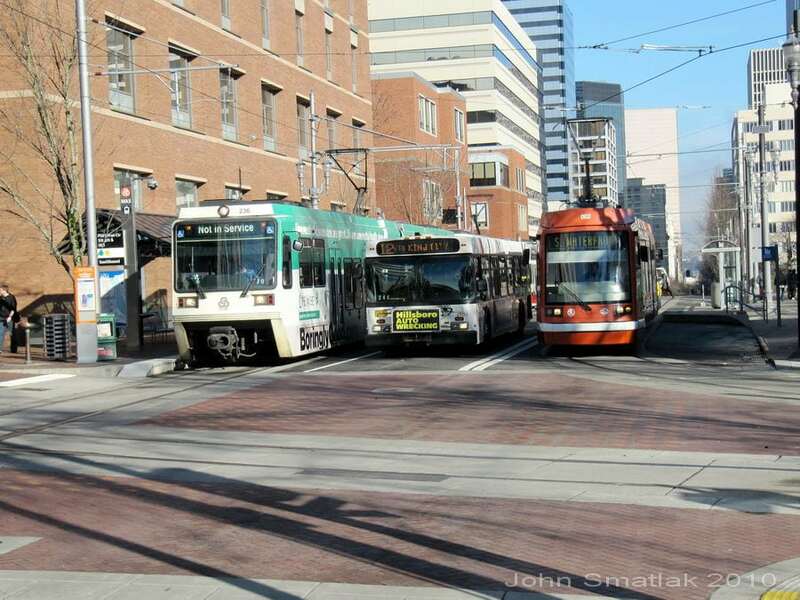 providing for a stop that can easily be shared with buses. the walls of adjacent buildings. 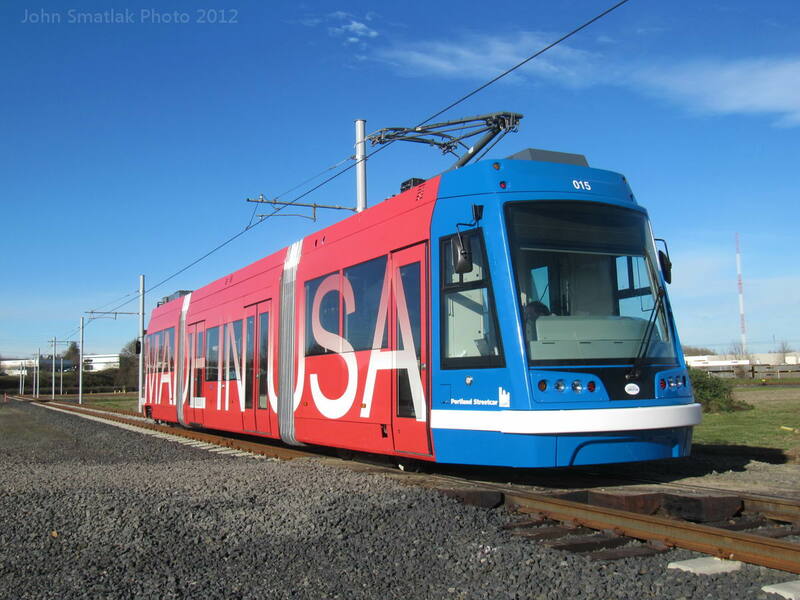 created from a large area of abandoned rail yards. 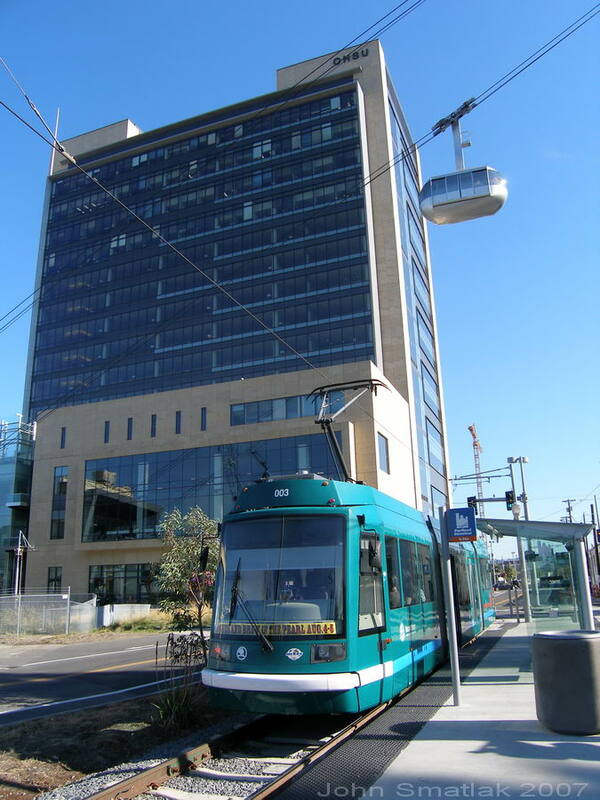 tramway that connects to the OHSU campus. way southbound) in front of restored Union Station. 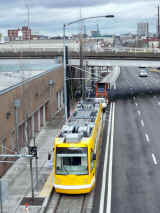 Streetcar" sign at 10th and Northrup. lighting at the same time. salvaged cobblestones for the transit lane. 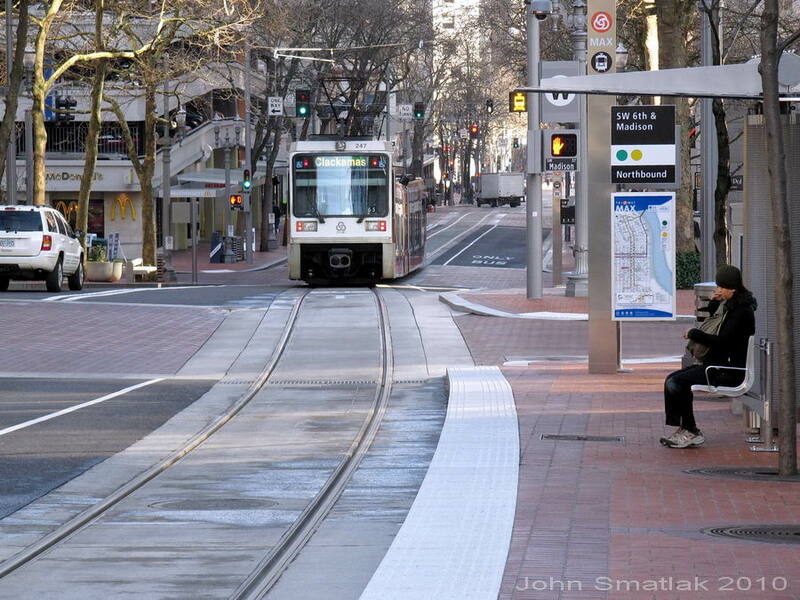 LRV boards at the Pioneer Square stop. share of grades throughout much of the alignment. yet for when it will enter service. 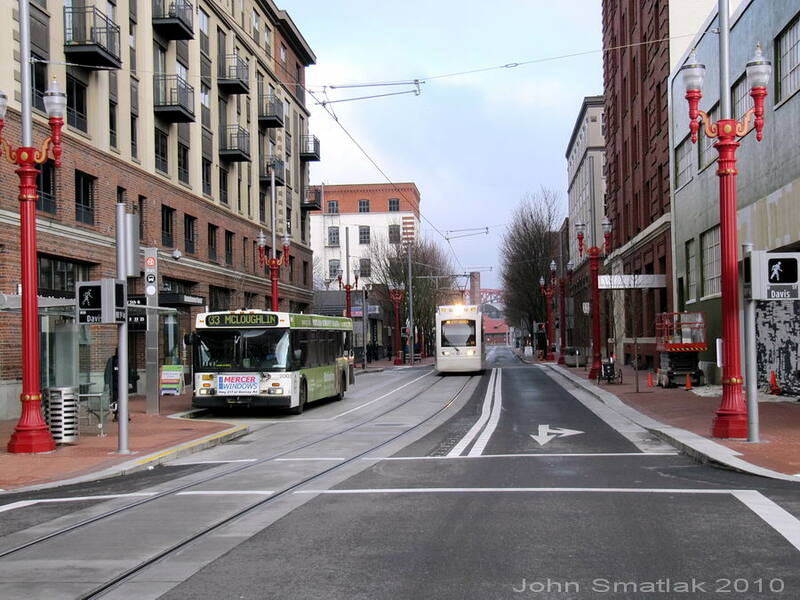 February, 2012- Construction of Portland Streetcar’s new Eastside Extension was substantially completed in January. 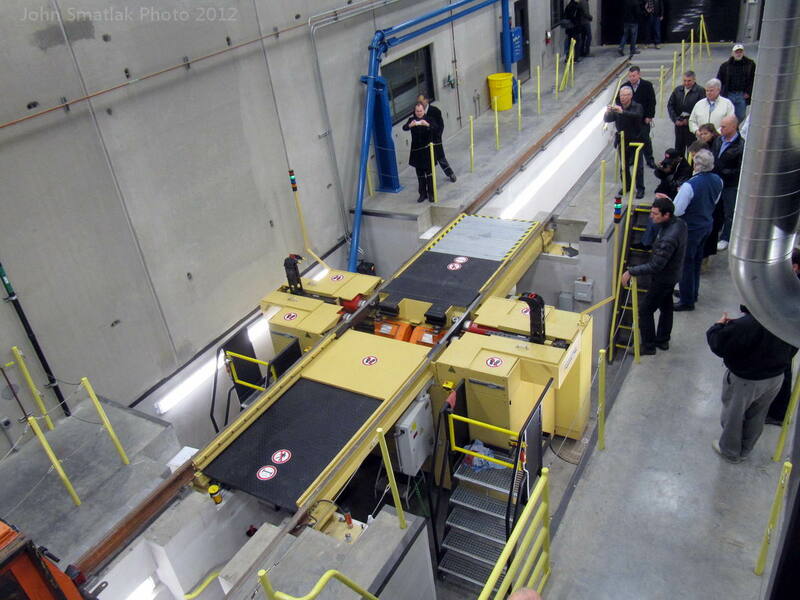 The first test trips over the new alignment took place in February. The newly expanded maintenance facility is now in use, providing two additional indoor service tracks and an in-ground wheel truing machine. 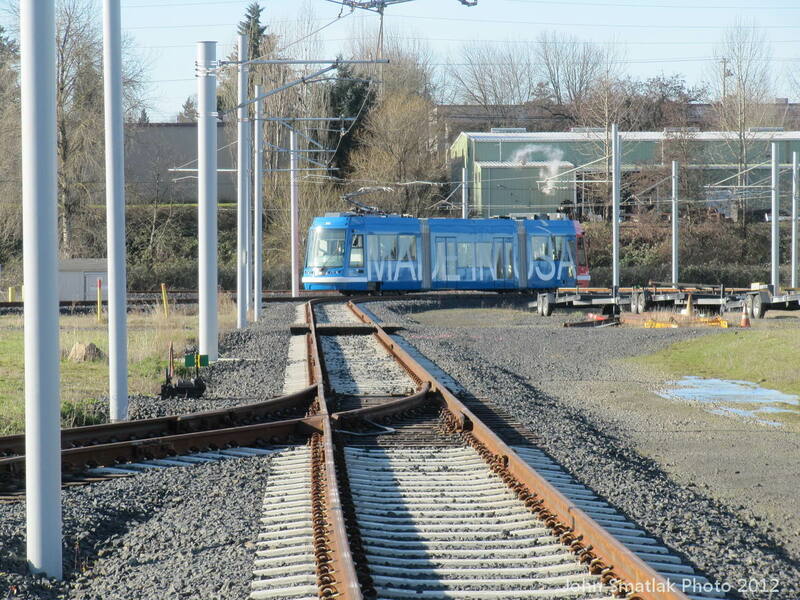 The APTA Streetcar Subcommittee visited Portland January 13-14 and took a tour of the newly completed Eastside alignment as well as the new Moody extension and the adjacent components of the TriMet Milwaukie LRT extension which are now in construction, and the United Streetcar facility in Clakamas. 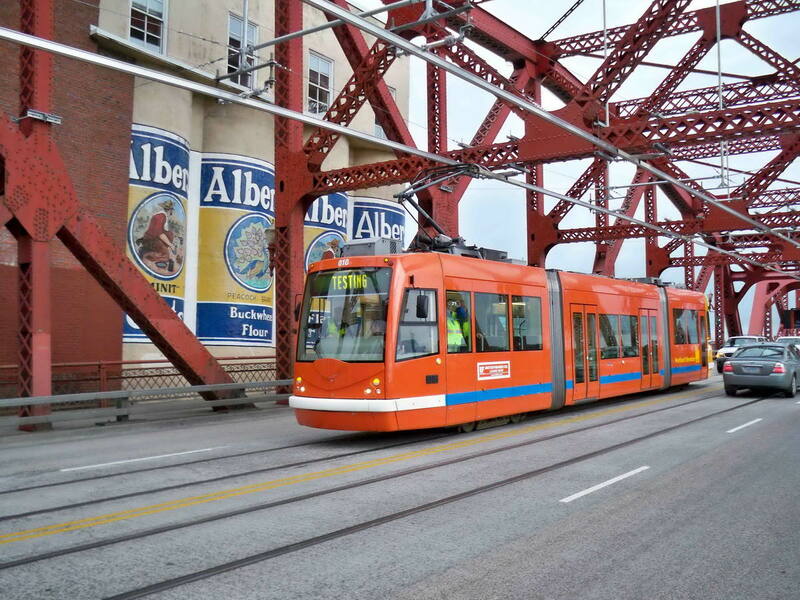 Thanks to Eric Sitiko and Laddie Vitek for the news and photos of the streetcar testing. cross the river on a new bridge. 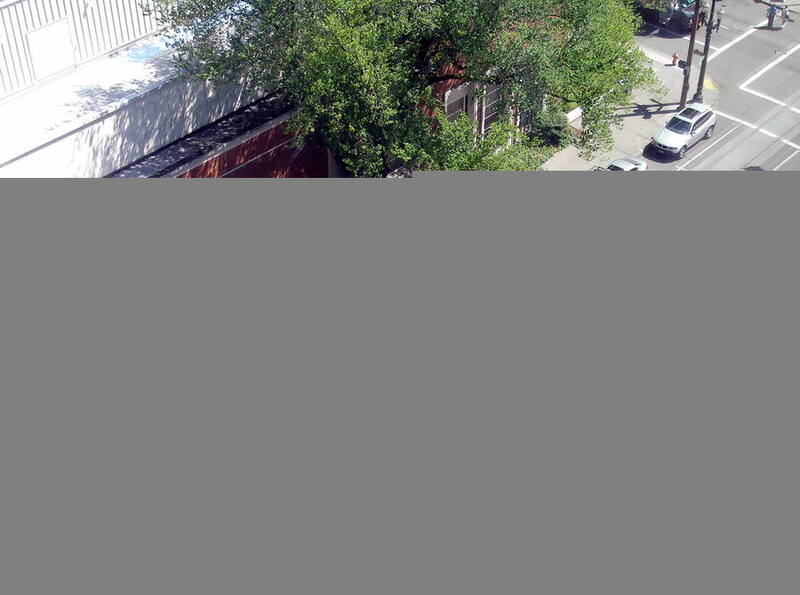 undisturbed and facilitated access to adjacent development. 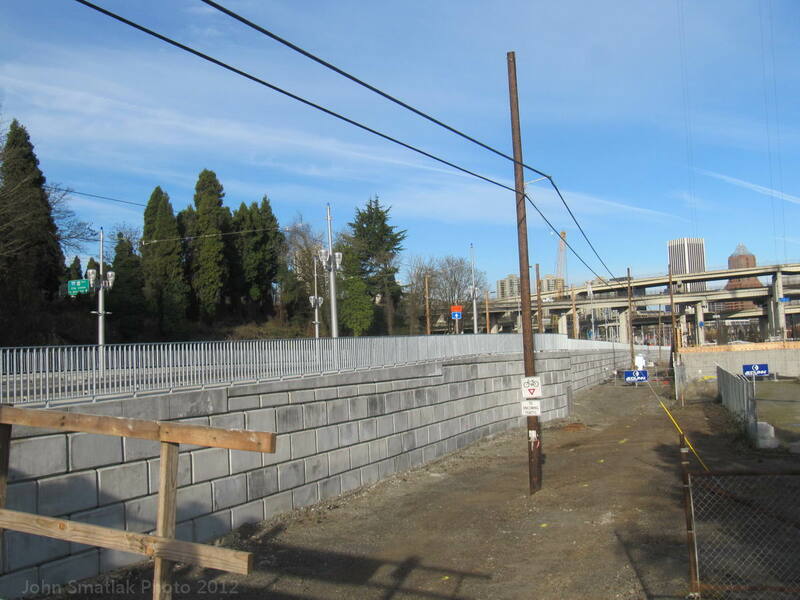 Milwaukie LRT bridge is under construction. 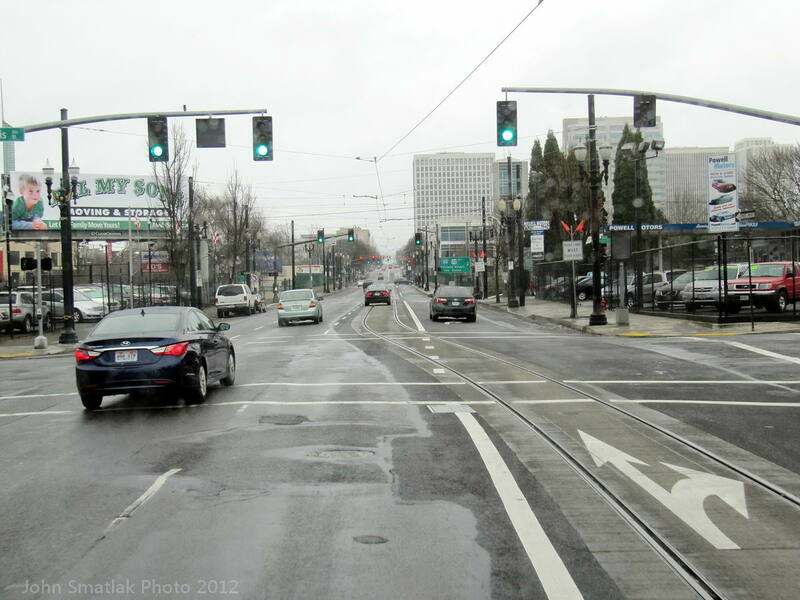 “close the loop” on the new alignment. 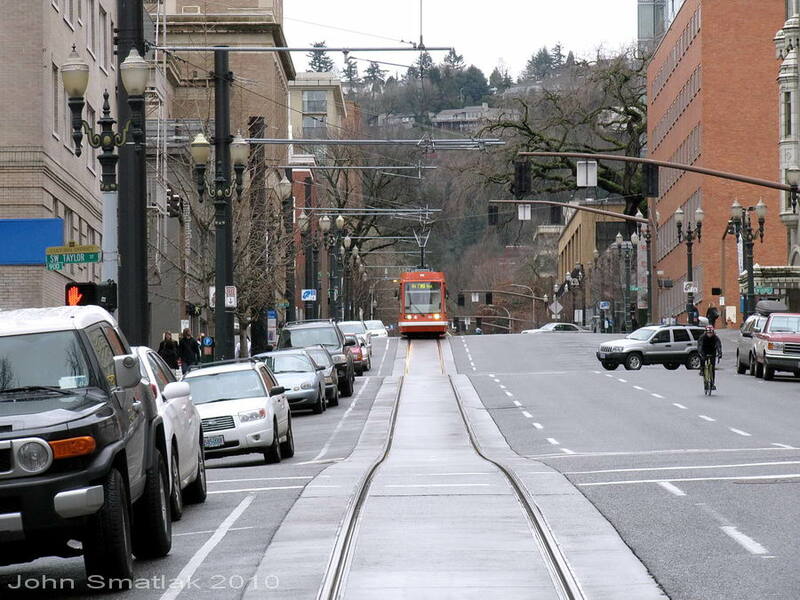 car in the Pearl District. Laddie Vitek photo. of the intersection traffic signals. have returned to the Broadway Bridge. Laddie Vitek photos. 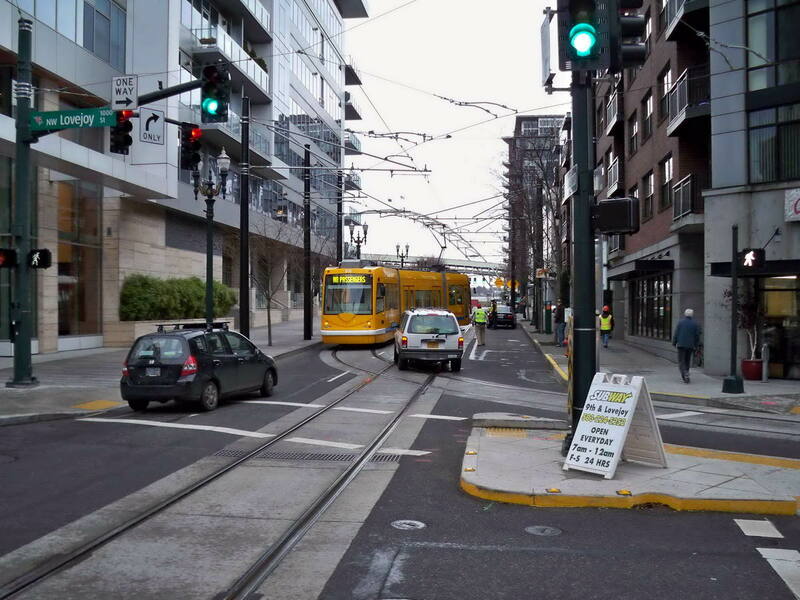 test streetcar operated over the new Eastside Extension. 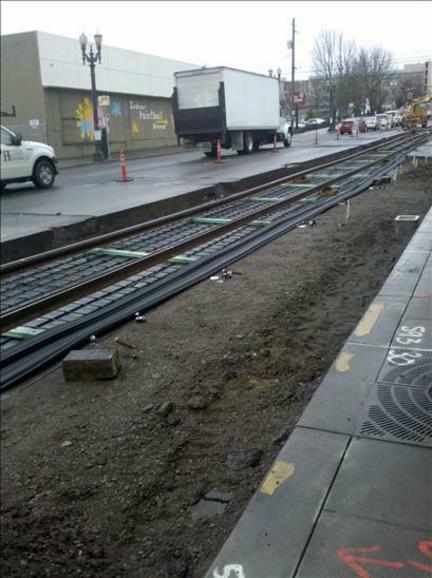 Eastside Extension. Laddie Vitek photos. 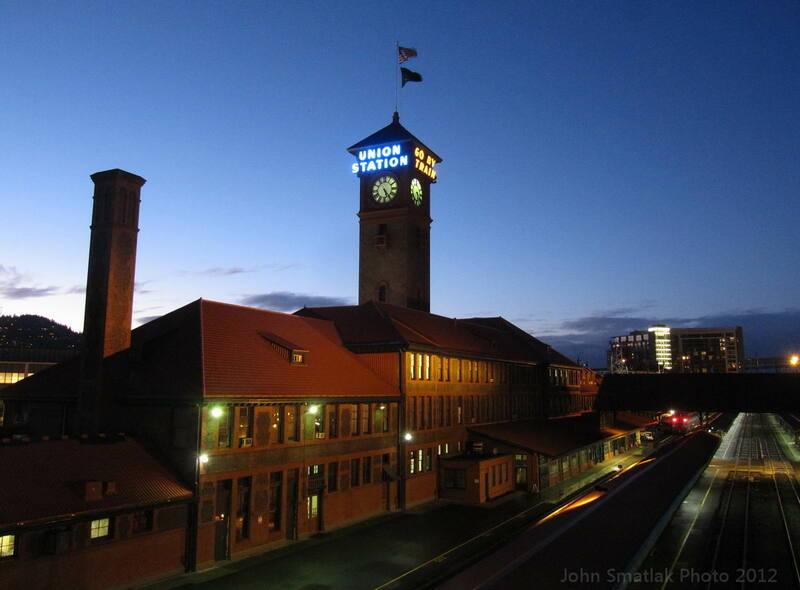 a classic- Portland Union Station at dusk. 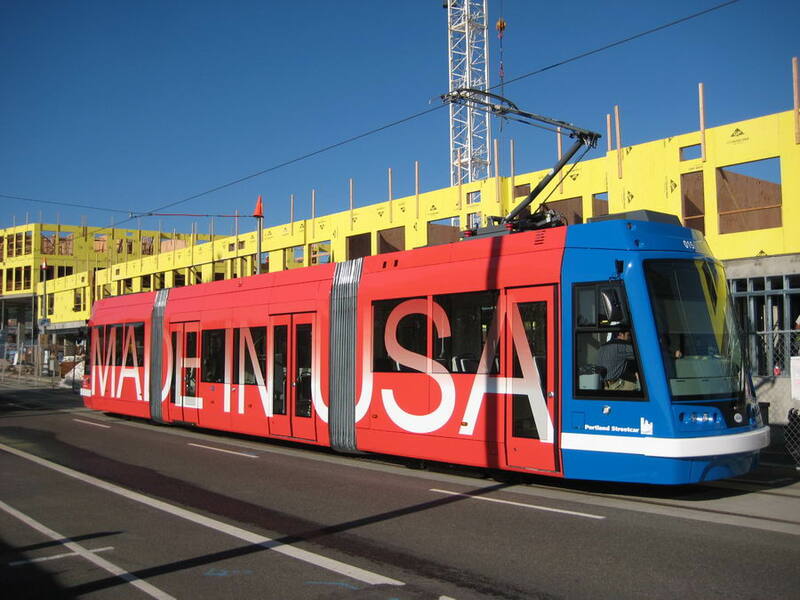 September 25, 2010- As seen in the pictures below, track construction for Portland Streetcar’s new Eastside Extension is in full swing. 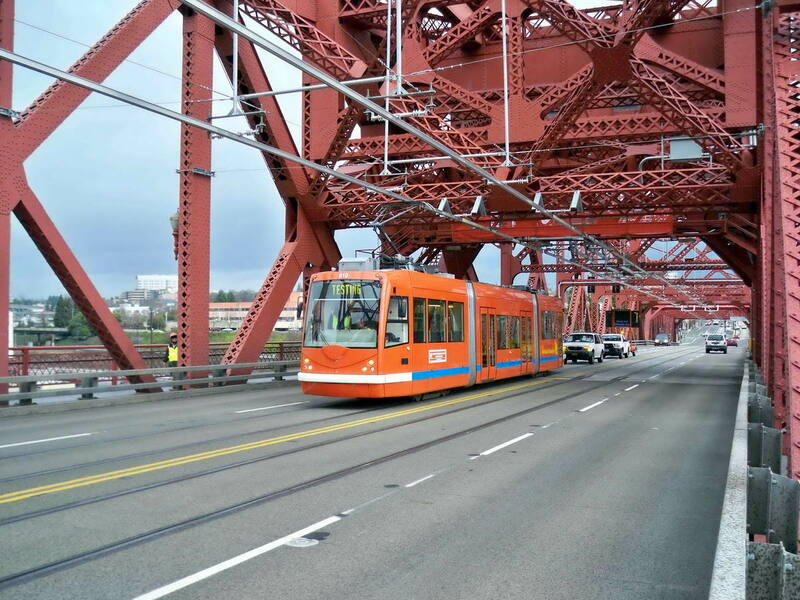 In some locations such as the Broadway Bridge, crews must first remove the old narrow-gauge rails of Portland’s original streetcar system, abandoned decades before. Work is also underway to construct an additional building at the maintenance facility site. 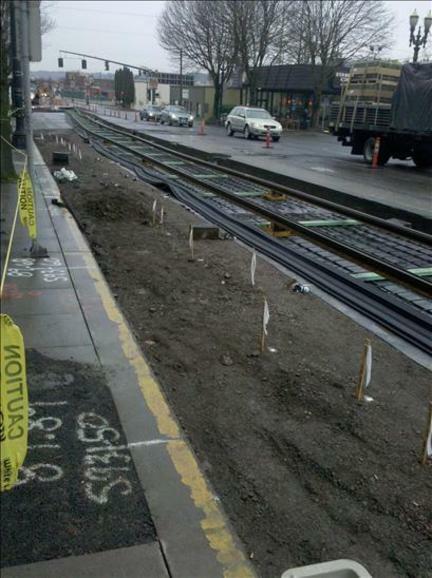 February 4, 2010- Track construction for Portland Streetcar’s new Eastside Extension is officially underway! 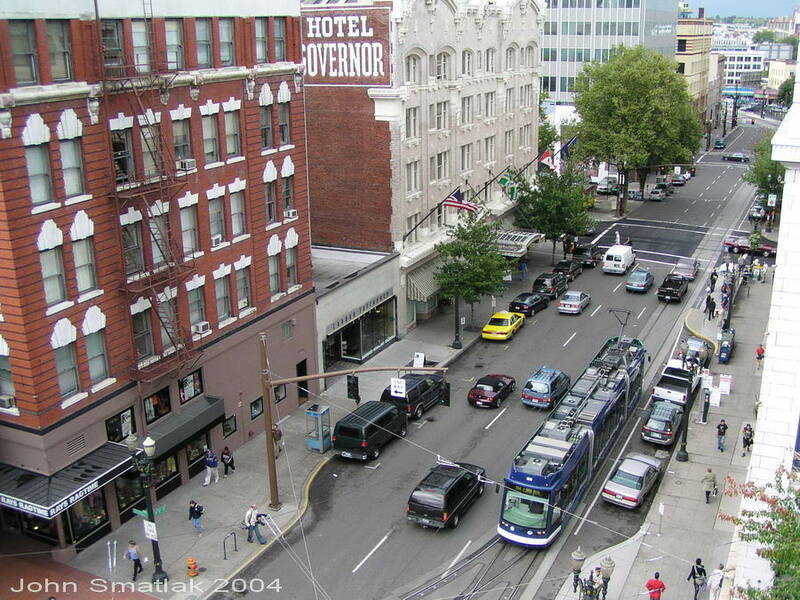 This blog entry on Oregon Live has more info. 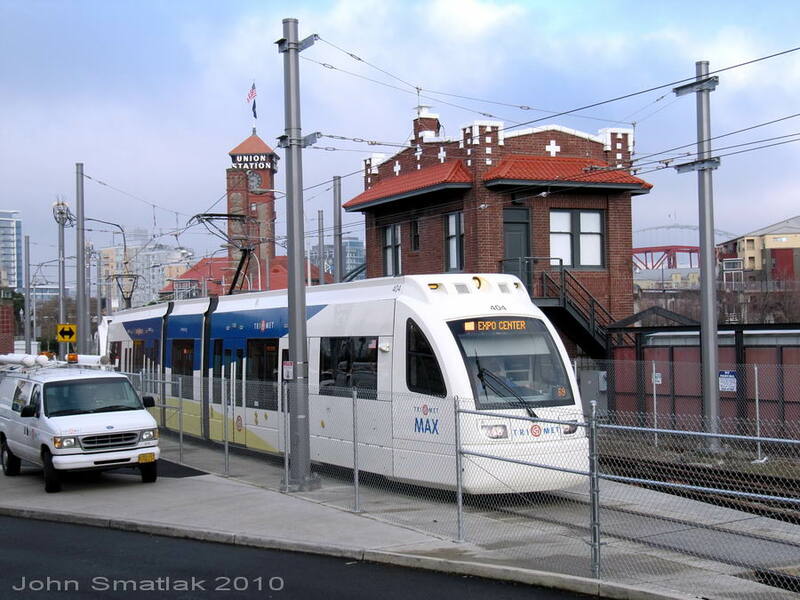 November 5, 2009- Federal officials recently made the official dedication of $75M in funding for the Portland Streetcar’s new Eastside Extension. 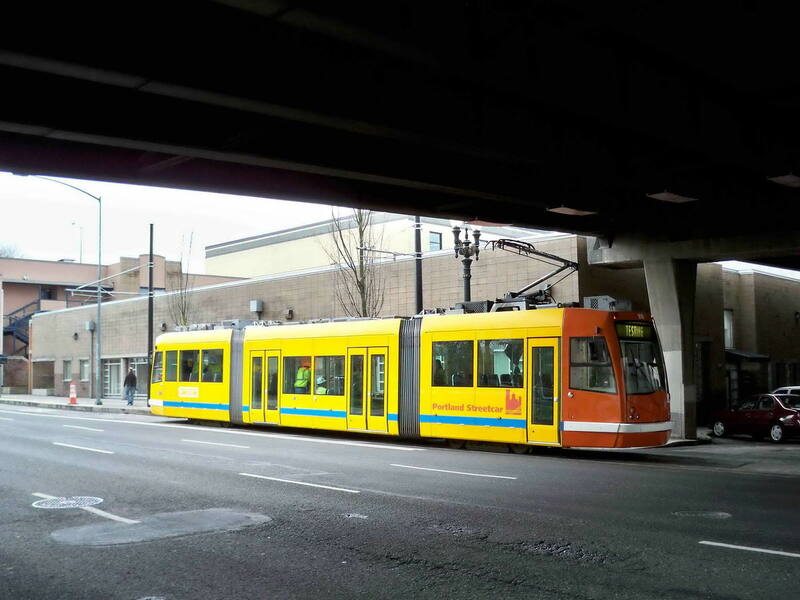 Oregon Live.com carried a good article on this and other news concerning the other elements of Portland’s growing streetcar network. The official Metro page covering the project is here, and contains copies of the various assessment documents relating to the project. 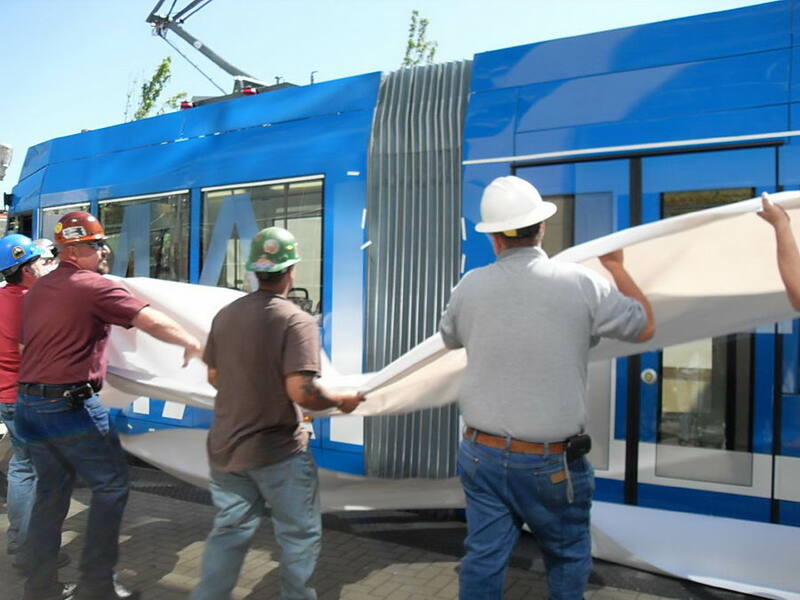 Meanwhile work continues to get the new streetcar vehicle from Oregon Ironworks in service. 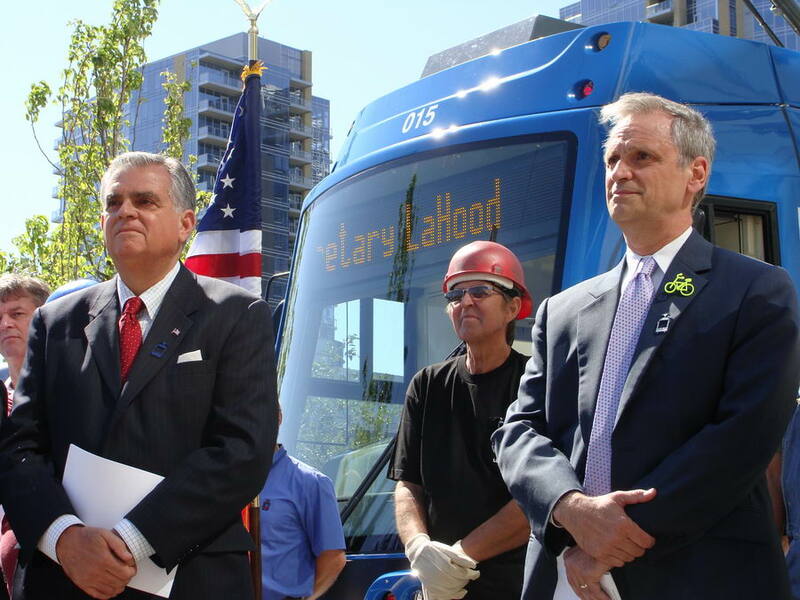 July 8, 2009- Portland Streetcar’s new vehicle from Oregon Iron Works was unveiled in a July 1 ceremony attended by US Secretary of Transportation Ray LaHood. 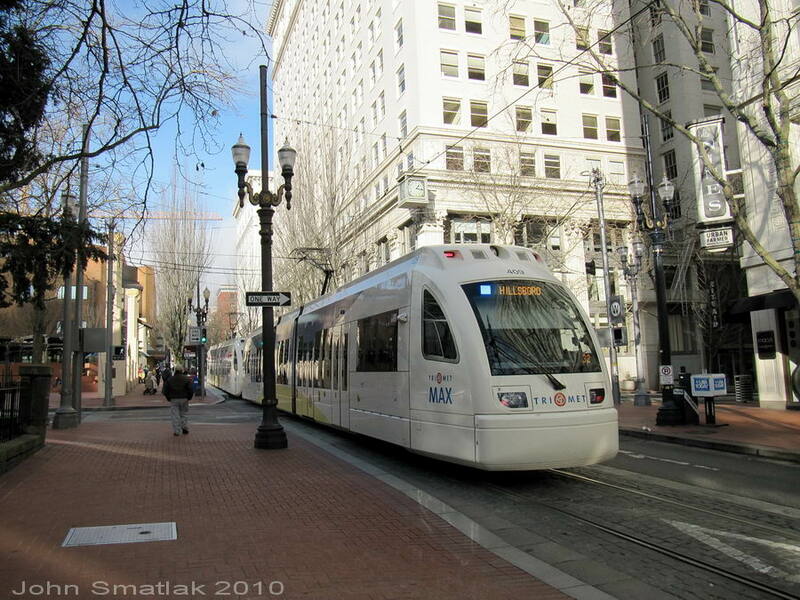 The Portland Transport blog has additional coverage of the event including a video. The car will now undergo extended on-line testing. 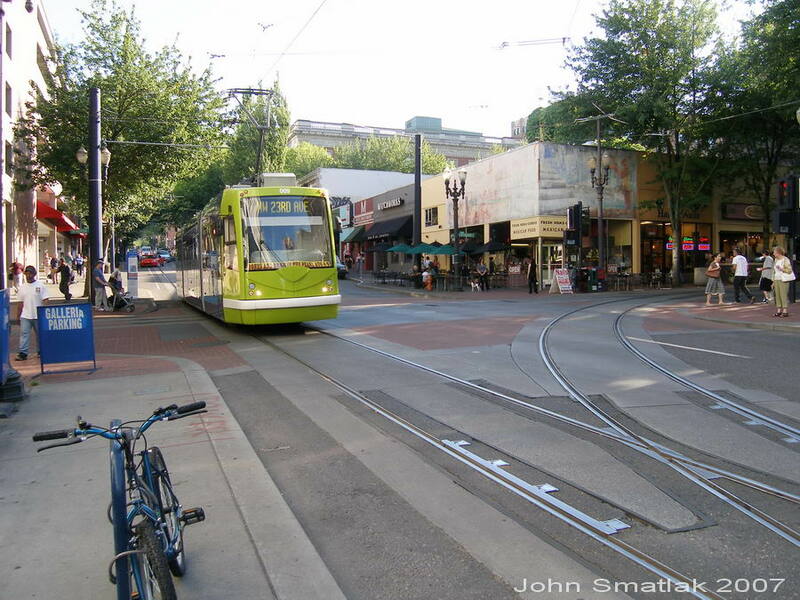 May 2009- $75M in federal funding has been obtained for the latest extension of the Portland Streetcar. 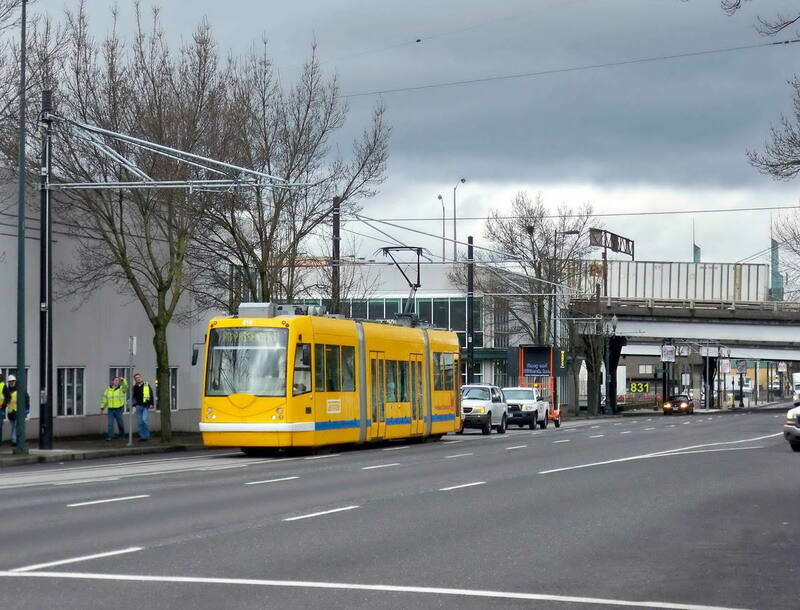 The new 3.3 mile streetcar loop is a $127M project, and will extend service from the Pearl District in NW Portland, across the existing Broadway Bridge, serving the eastern half of the Portland Central City. 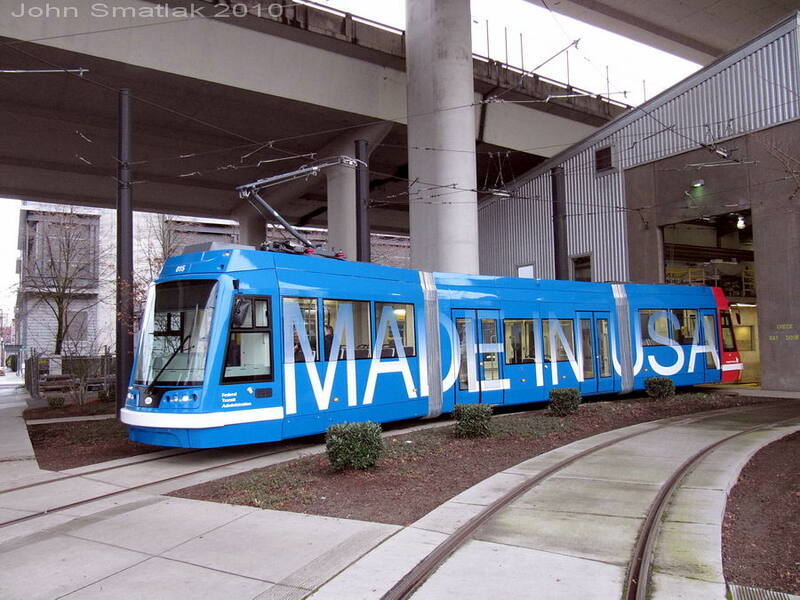 The Bee is also reporting that the first modern streetcar produced in the U.S. under license from the Czech firm Skoda is due to be delivered to Portland Streetcar sometime this summer by United Streetcar LLC, a subsidiary of Oregon Iron Works. 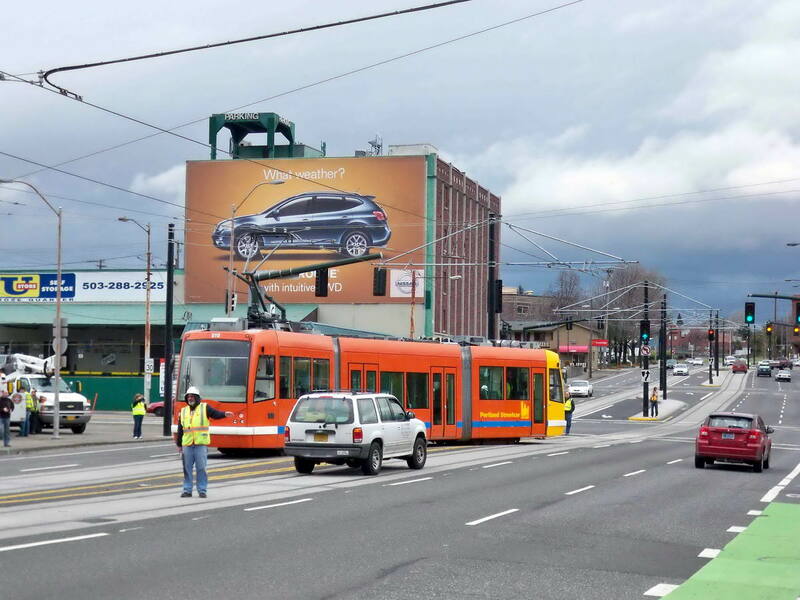 The article also reports that United Streetcar anticipates an order for six additional cars for the new Eastside Streetcar Loop. 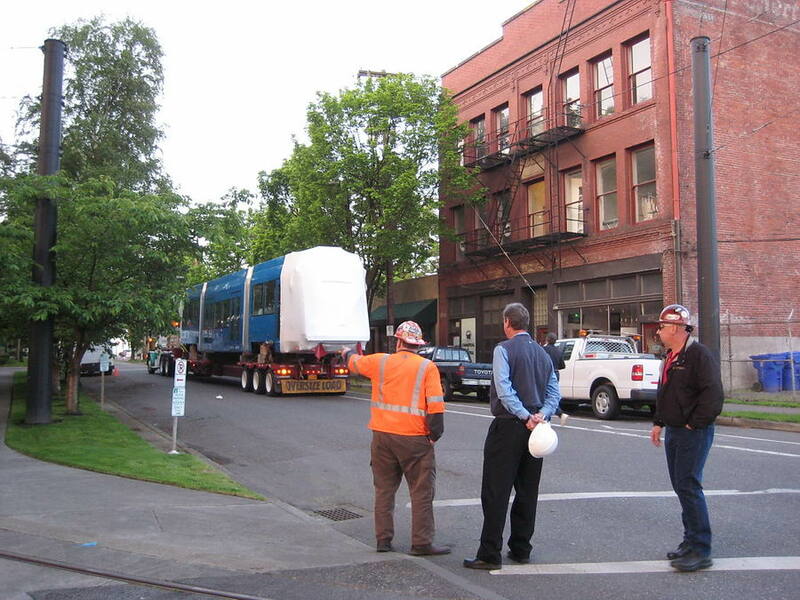 May 27, 2009- In late May Portland Streetcar took delivery of the prototype streetcar vehicle from United Streetcar LLC. The car is currently undergoing testing. Some photos of the new car appear below. 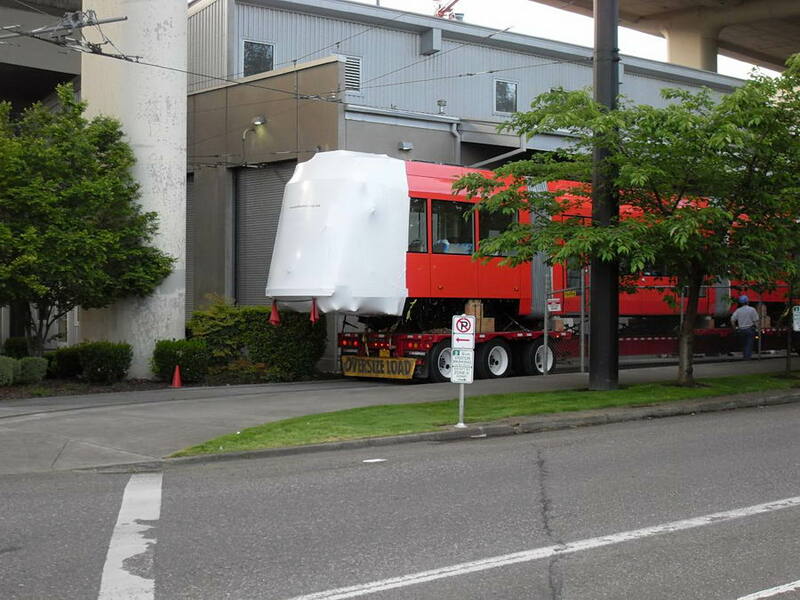 A video of the unloading was also posted on the Portland Transport blog. 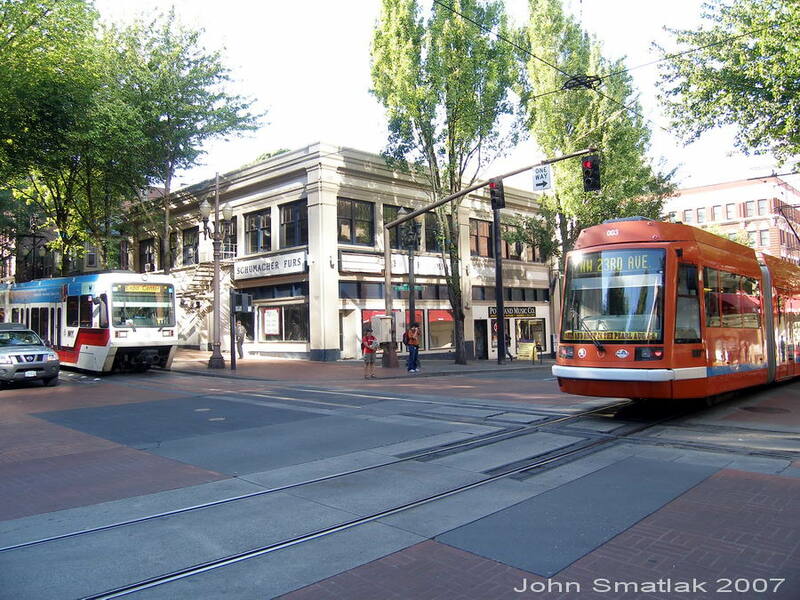 September 2007- the latest extension of the Portland Streetcar opened on August 8. 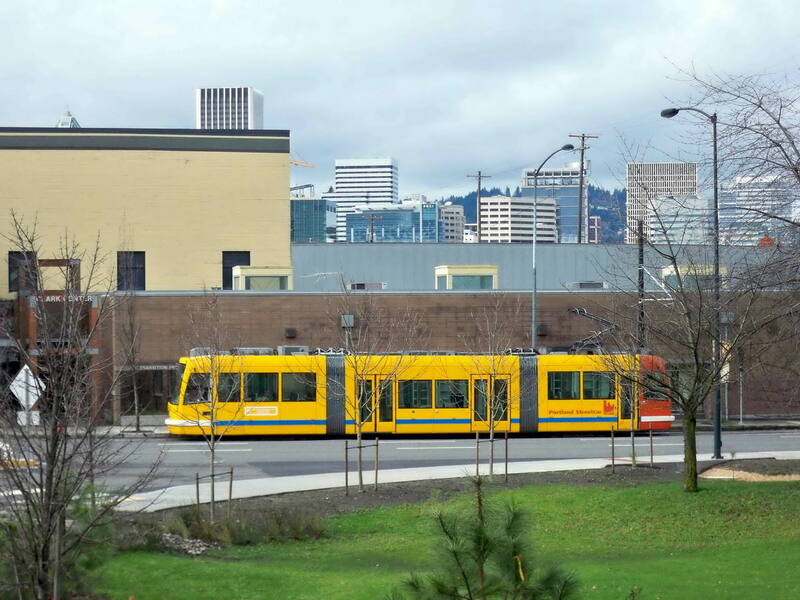 The new Lowell Extension provides a loop through the South Waterfront district and brings the one-way length of the streetcar line to 7.2 miles. 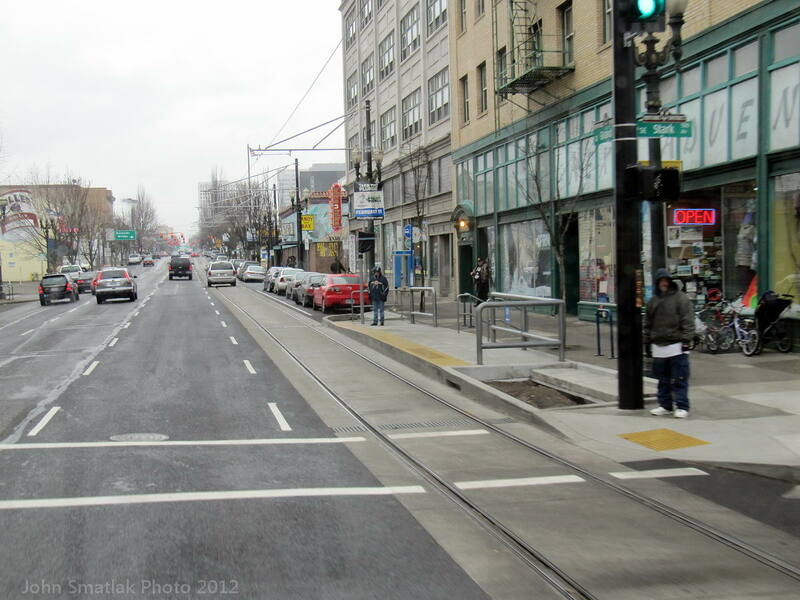 Details about the grand opening are available on the Portland Transport blog. 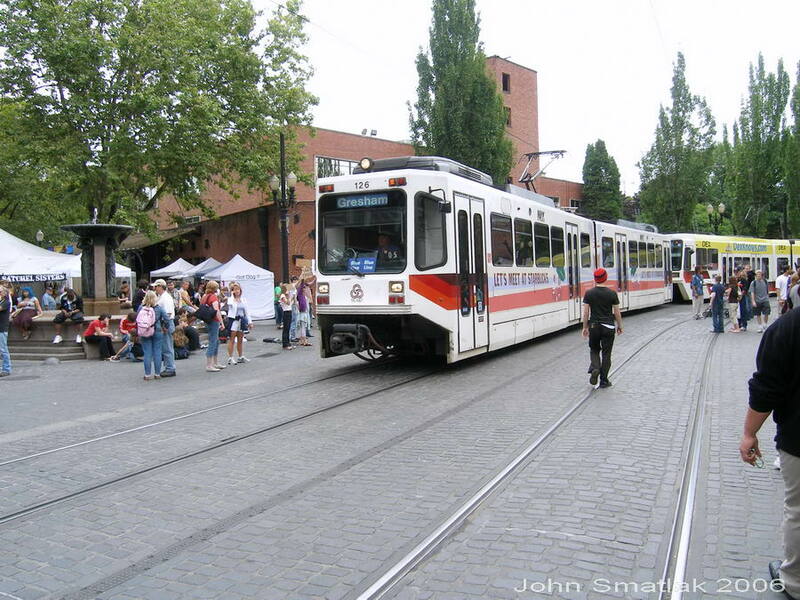 The photos below are from my July 27 visit to Portland to attend the Streetcar Workshop presented by Reconnecting America. Whitaker, showing the new rail alignment. 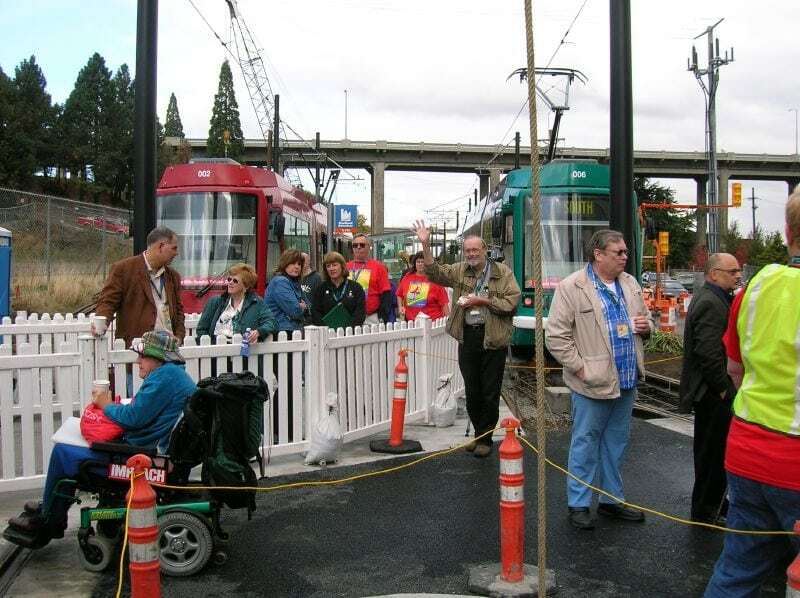 11/23/06- Service began October 20 on the new Portland Streetcar South Waterfront Extension to SW Moody and Gibbs. 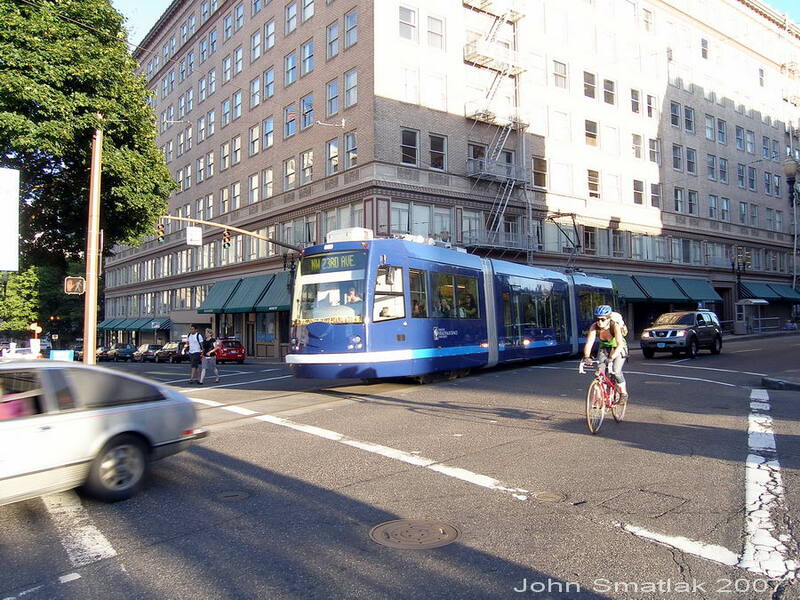 Photos of the event can be found on the Portland Transport Blog. 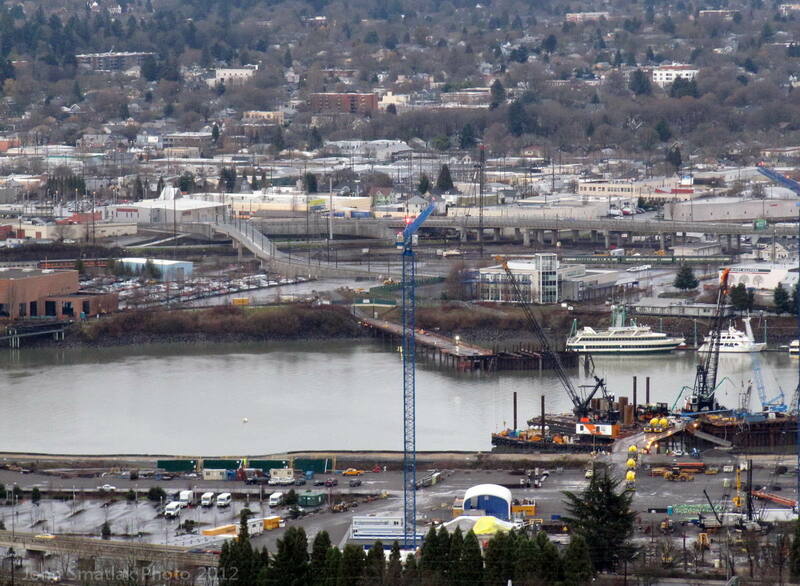 Construction continues on the adjacent Portland Aerial Tram, which will provide a connection to the OHSU campus. 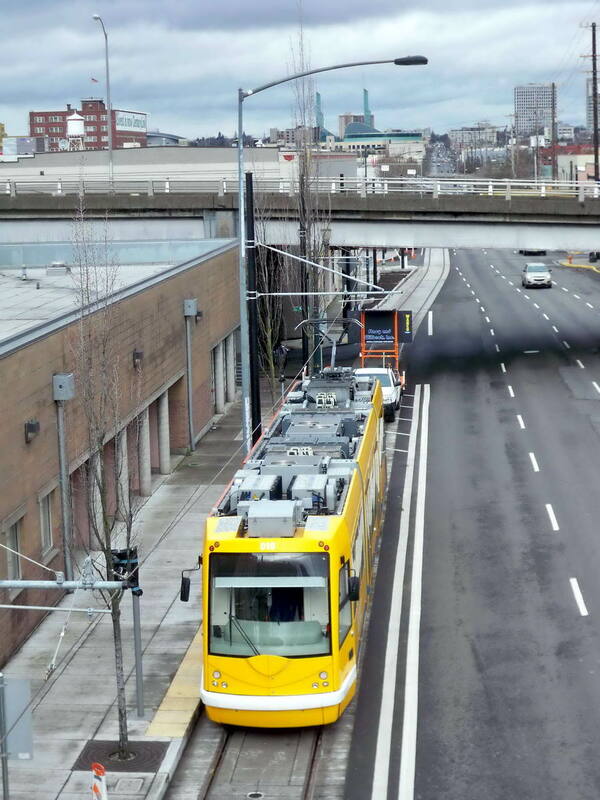 Construction also continues on the Lowell Extension of the Portland Streetcar, with service anticipated to begin in the summer of 2007. 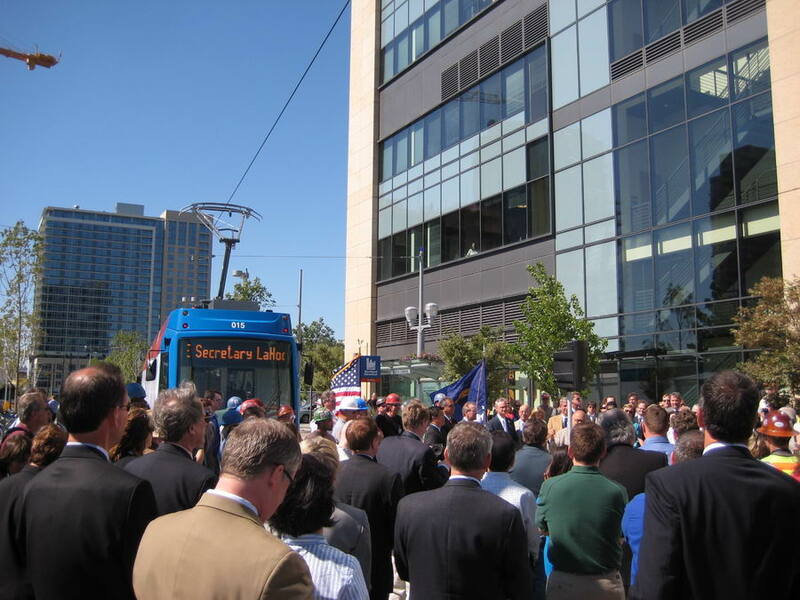 6/26/06- Opening day ceremonies for the Portland Streetcar South Waterfront Extension are scheduled for October 6, 2006. 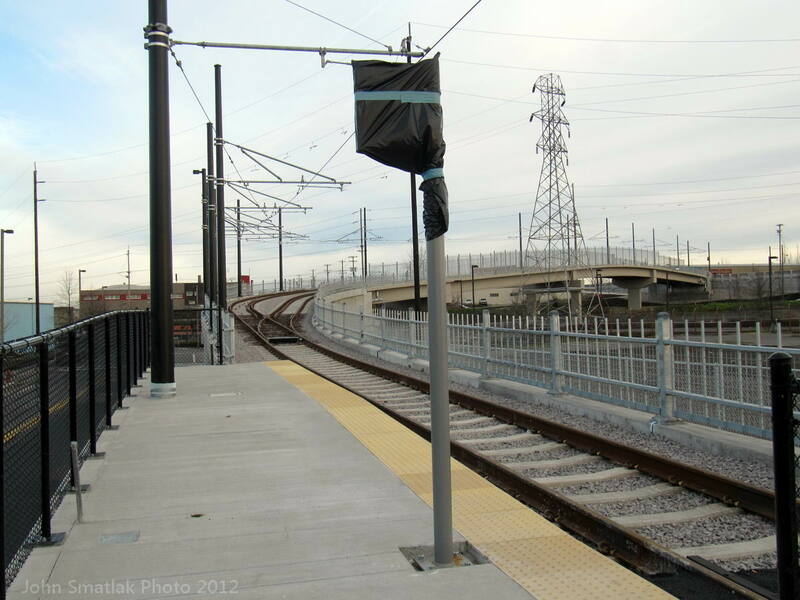 This latest extension advances the line another .6 of a mile beyond the the previous Riverplace extension (which opened in March 2005). 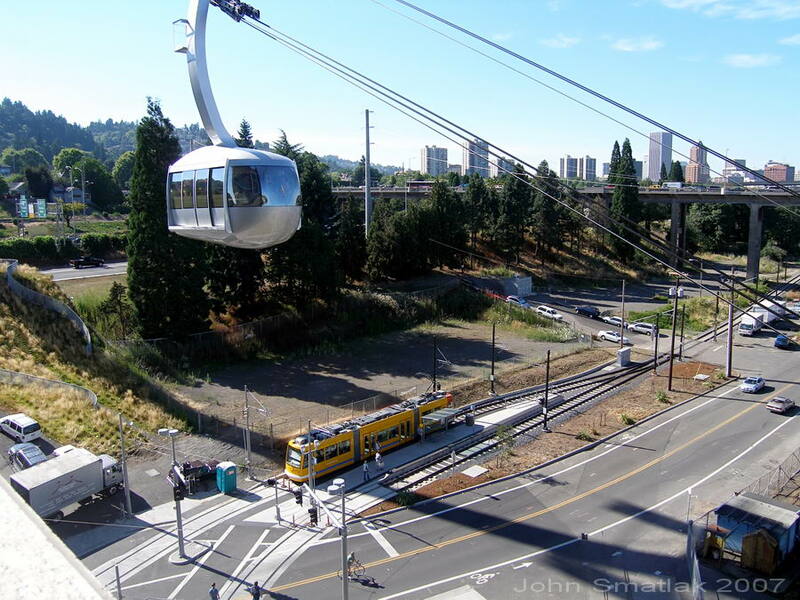 The latest extension will provide a convenient connection to the Portland Aerial Tram being built to serve the OHSU campus on Marquam Hill. 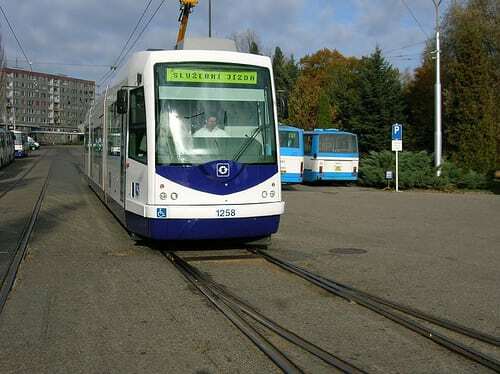 Three additional Skoda streetcars are expected to begin arriving in Portland in September 2006. 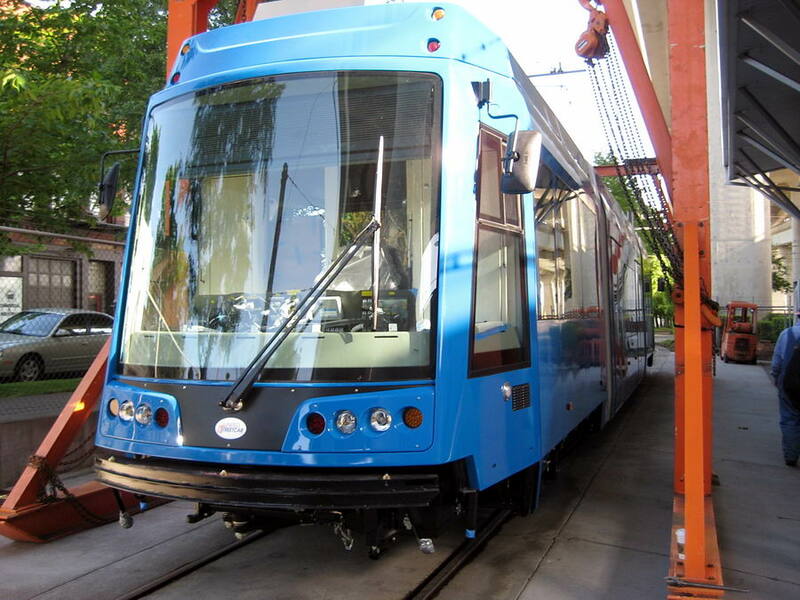 Click here for a link to the Portland Transport blog and photos of the three cars under construction. 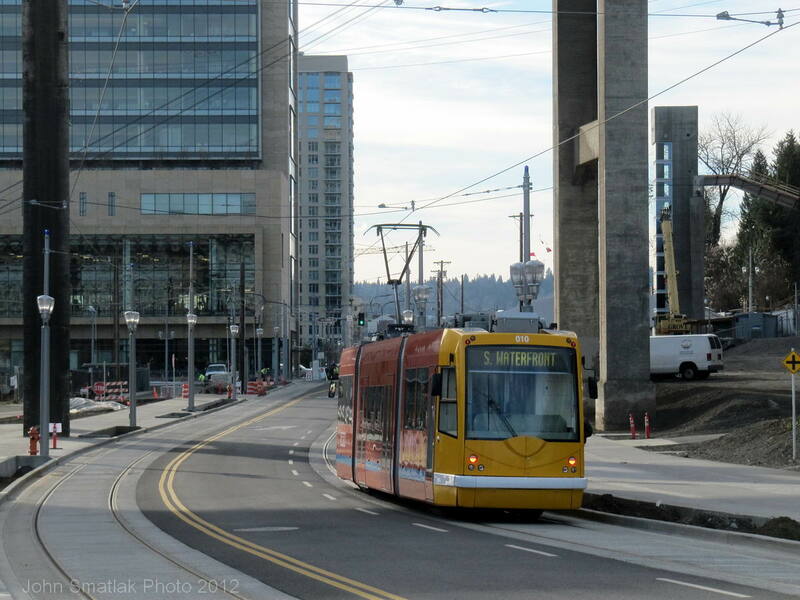 9/28/04- Construction is well along on the Portland Streetcar RiverPlace extension. 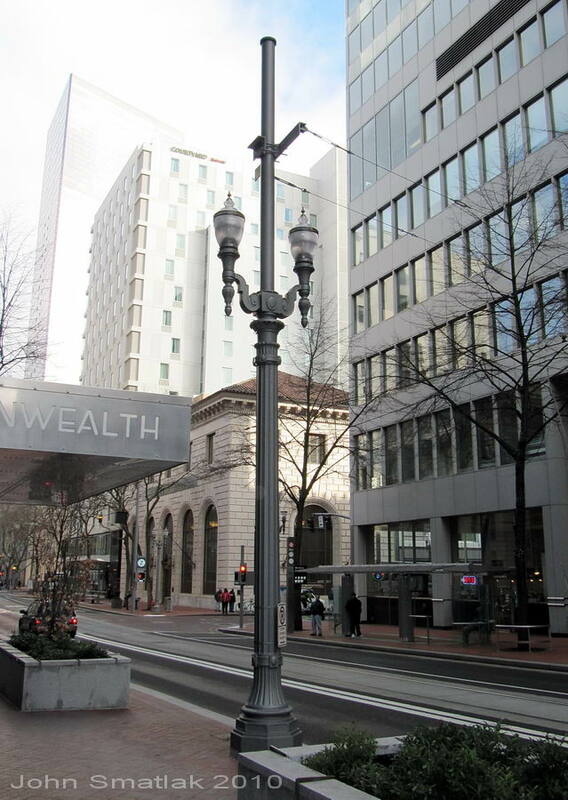 Scheduled to open in March 2005, the extension will connect the PSU campus with RiverPlace on the banks of the Willamette River. A visit in mid-September found tracks in place over most of the extension. 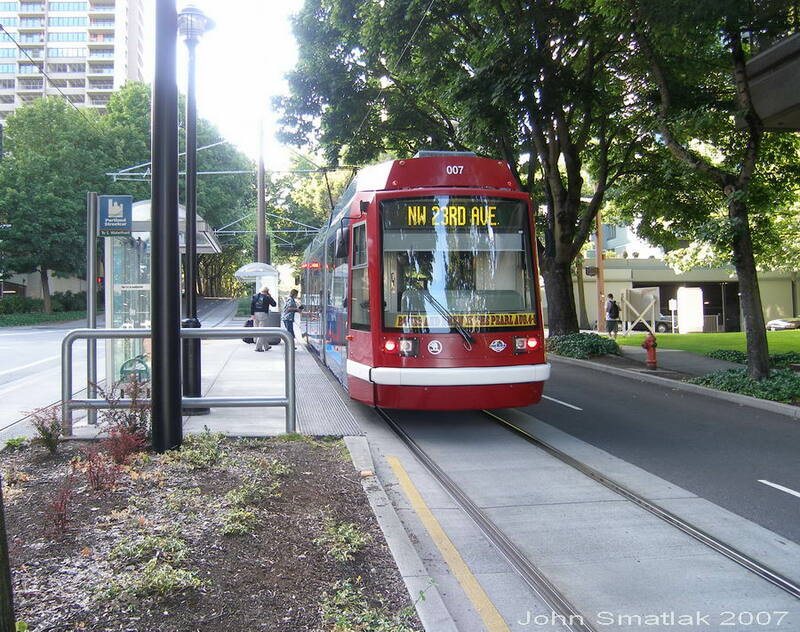 Approaching RiverPlace, the new line crosses the former end of the Willamette Shore Trolley operation, and will ultimately be extended a short distance more to provide a connection to an aerial tramway being built to serve the OHSU campus on Marquam Hill. 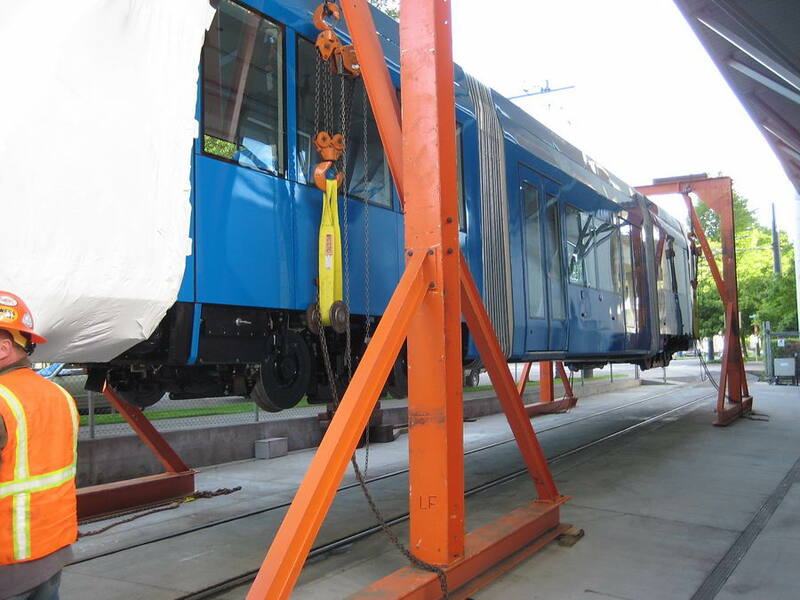 Two additional Skoda streetcars have been purchased to cover additional service requirements. 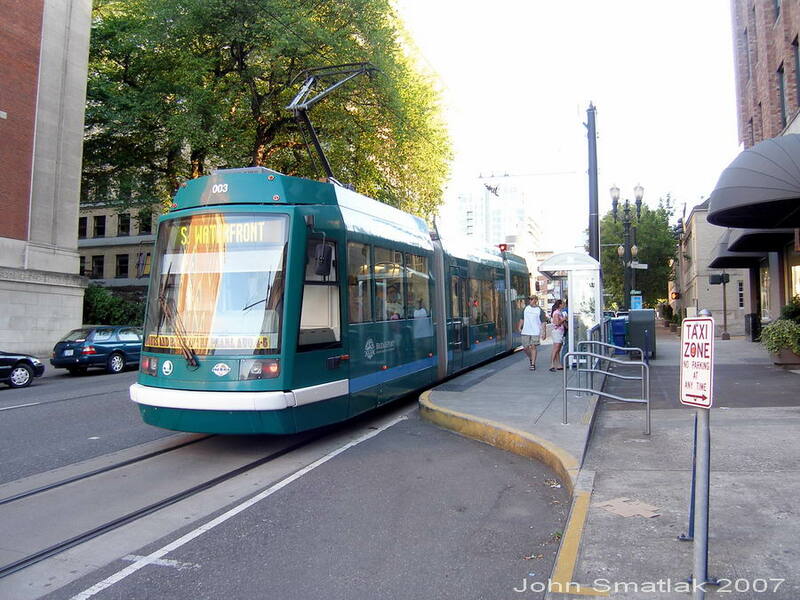 Update 7/27/01- The new Portland Streetcar began operation on July 20. 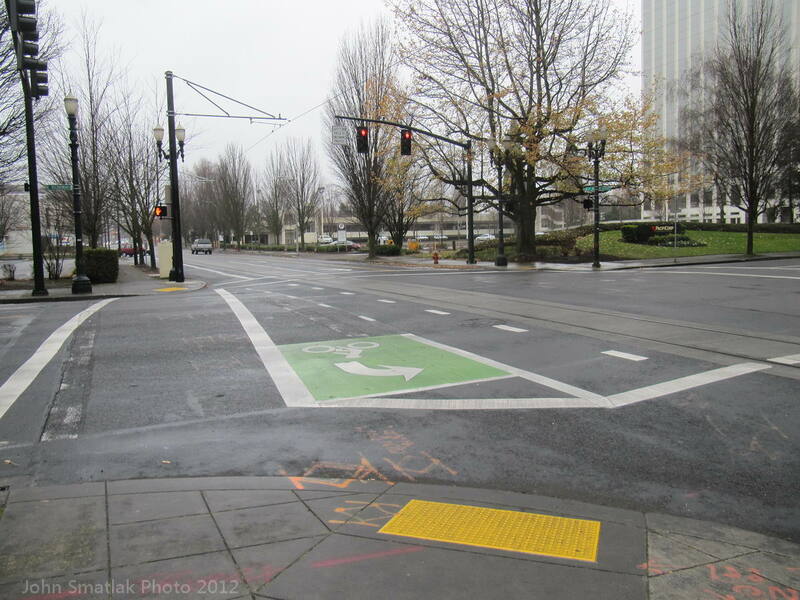 The project features all street-running track, and made extensive use of minimal impact “shallow slab” construction. Details on the track construction technique are available from an interesting article on the Gomaco World web site.